Winkeland: Hey, it's still Summer right? I could have sworn that Summer just started. Retailers are cutting my Summer high short this year by already stocking bits and pieces of their Fall collections. 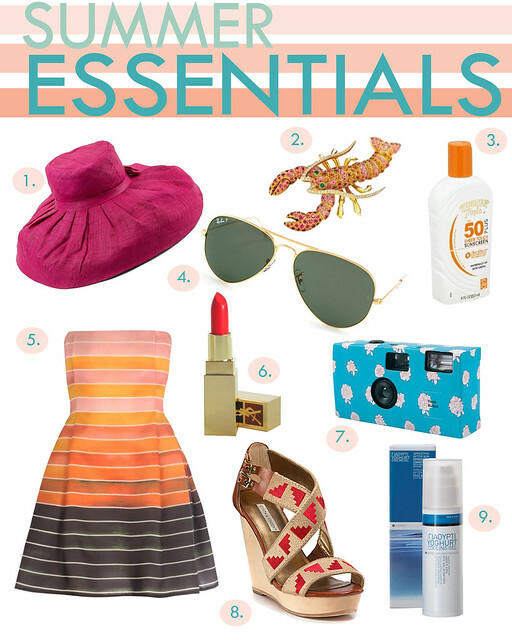 Anyway, since I'm sure we all have a couple beach weekends ahead of us, I put together my list of Summer essentials. 1. Hat - Love this hat so much I posted about it here. Got to get one soon! 2. Lobster -It's Tiffany & Co and 27,000 dollars but you get the brooch idea. 3. SPF - Hawaiian Tropic SPF 50. It pains me that my favorite sunscreen in the whole wide world is no longer sold in stores. Yes, we did order it in bulk. 4. Glasses - Classic look. Complements EVERYTHING and ANYTHING. 5. Dress -Short, fun and frilly summer dresses! 6. Lipstick -YSL's Rosy Coral. Pretty much my go to shade for this Summer. 7. Camera -Disposables are making a comeback. When you get the film back, you'll get that retro summer look. 8. Wedges -Always fun for those warmer days. 9. Aftersun -Ouchy, I'm red! Korres Yoghurt Cooling Gel can calm that burn. You can also try putting aloe vera gel in ice trays and freezing them for an even more relieving treat.